“She didn’t hang herself,” Fred replied, “I put her there to dry.” Judging people can be a delicate, difficult and dangerous action! One of the most well known verses in the Bible is found in Matthew 7:1, where Jesus said, “Judge not that you be not judged.” This is perhaps the most commonly quoted and misapplied verses from the Bible. This is used frequently as a silencer for any observation or objection made by Christians, or any person who holds to moral absolutes, regarding moral and ethical issues. A lot of people assume that the statement to “judge not” means that we must see no evil, speak no evil, and hear no evil as far as moral issues are concerned. They suppose that we can maintain some sort of neutrality towards wrong in the life of another person so as to never make any kind of examination, discrimination, discernment, or judgment. 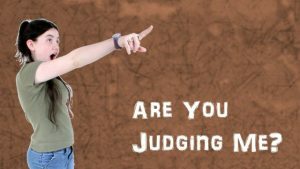 As a Christian, or one who believes in moral absolutes, how are we to respond to the constantly recurring statements, “I thought you were not supposed to judge?” “Who are you to judge me”? Are we or are we not to exercise judgment? Yes and no. Yes, we are commended and commanded to judge rightly. No, we are forbidden to judge wrongly. In reality, life requires that we make judgments all the time. In another verse, Jesus, speaking concerning judgment, says: “Judge not according to appearance.” By this Jesus meant that we are not to critique, judge, and examine on the basis of the way things appear. Then he goes on to say, “But judge righteous judgment” (John 7:24). When then is it wrong to judge? 1. When I do so destructively. Judgment is wrong when I engage in destructive criticism; when I aim at destroying, silencing, or slandering rather than at restoration; when I intend to ruin instead of attempting to raise the person to the level of truth and right. There are, and always will be, people and groups that we disagree with theologically, socially, or politically. But we seem to cross that line between discernment and destructive judgment so easily today. In present political rhetoric, or in descriptions of other faiths and nationalities, we quickly devalue or write off “those people” as less valuable. We exclude them from the status that we feel privileged alone to occupy. 2. When I do so hypocritically. When you and I will not allow in others what we allow in ourselves, then we are involved in wrongful, hypocritical judging. 3. When I do so habitually and presumptuously. We are to make sure that before we render a critique, a judgment, an examination, that we have the facts as best we are able to discern them. But if we do so presumptuously and habitually, then we set ourselves the ultimate authority of right and wrong. 4. When I do so officiously or magisterially. This type of judgment is outside of my jurisdiction. This belongs to the civil government. I cannot judge as a magistrate unless I am a magistrate. I cannot judge officiously. 5. When I judge hastily, rationally, and unmercifully. Judging in this manner involves judging another person’s motives. No one, save God, can know another person’s motives. We naturally judge over-harshly. We tend to always put the worst construction upon what we see and hear about others, and to make small, if any, allowance for the hidden good that is in them. Also, we unwittingly judge of others by the worst parts of our own disposition, and not by the best. It’s common to impute our evil to others, but to think our goodness is peculiarly our own. 6. It’s wrong when we judge minutely. We are not to be judging in minute things that don’t really matter. It is this type of activity that we are usually involved in when we judge one another. Watch out for a judge, jury, and executioner’s critical, censorious spirit that is always condemning, castigating, and criticizing, and passing sentence. Guard against a spirit that is filled with pride and envy that is nothing more than disguised hatred. This spirit elevates itself by all always putting others down. It appears to make progress when in reality it hasn’t gone anywhere. It has just climbed upon the bodies of fallen brothers and sisters. How Can I Know if I Have Been Wrongfully Judging? Do I get a malicious satisfaction in finding fault in others? Do I get a secret sense of satisfaction from learning that someone has had a grievous moral lapse? Do I get a feeling of smug, self-righteousness at the news of another person’s fall? Do I put prejudice in the place of principle? Do I constantly express an opinion without knowledge of the facts? Do I avoid the trouble of trying to understand the circumstances? Do I try in my heart’s mind to put myself in the same circumstances. Do I tend to refrain from the exercise of mercy? Do I tend to spend more time talking to men about the situation than talking to God? Previous articleGame Over for NFL: Will they be bankrupt by the end of the season?